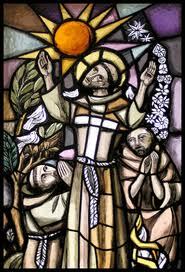 October 4 is the Feast of St. Francis of Assisi, one of the most beloved and, perhaps, least imitated of the saints. Too often Francis is sentimentalized and domesticated. Francis, however, sought identification with Christ through the poverty and suffering of Christ, his fellow human beings, and his own. He received the stigmata, the marks of Christ’s wounds, on the Feast the Holy Cross, September 14, shortly before his death. His final years were spent in great suffering and sickeness. During this time he composed what was originally entitled The Canticle of the Creatures and is more commonly known as The Canticle of Brother Sun. Most High, they will be crowned. What is the message of this “Canticles of the Creatures”?